Managing the various signal types and locations can be challenging; most media signals need to be encapsulated or adapted to work efficiently over a backbone that carries multiple signals. However, by taking advantage of the latest IP technology, networks can be simplified by consolidating all media traffic onto a common platform. This in combination with the falling prices of bandwidth plus the increased quality in video codecs and ultra-low latency delivery across WAN network infrastructure, means broadcasters no longer need to carry the high cost of producing live events on-site. The good news is that the technology is now available to enable broadcasters and network providers to convert and move the complete suite of broadcast signals - whether video, audio or data - onto their multi-service IP/Ethernet networks. 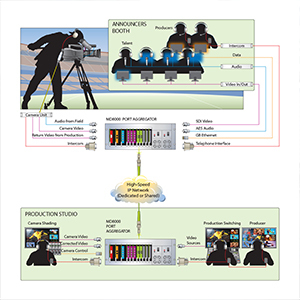 By using this remote production model, both 4K/60P, HD-SDI/3G-SDI camera feeds and data traffic can be sent from the remote venues directly to the studio, where all production and editing can take place. There are numerous advantages including the fact that editors can utilize more sophisticated in-studio tools across the board. It also reduces or removes the need for broadcasters to have full capability production trucks and large crews on-site at the venue, therefore, greatly reducing their operational costs. This is particularly relevant to the production of smaller-scale events, as costs can be held low while at the same time increasing the overall production value. The Remote Production over IP model is supported by Media Links MD8000 products that provide high quality and low-latency solutions for moving multiple paths of video content encoded using JPEG2000 and sent as Ethernet frames over an IP network. Sync is ensured over multiple points on the network, using IEEE 1588V2 Precision Time Protocol. Media Links MD8000 video over IP media transport and switching solutions combined with the Company's state of the art Network Management System provide an efficient, seamless and highly reliable way of moving content between shooting locations and the broadcast studio. The utilization of bandwidth is enhanced and media connectivity can be maximized over the entire IP network and over long distances. The Company's solutions are deployed globally by broadcasters, and major telco's and have been used to provide live content contribution for the Sochi Winter games and World Cup soccer, experiencing 100% uptime. In fact, Media Links has an installed customer base of over 1000 sports venues, serving customers on six continents, providing backbone technology behind many major events around the globe. Come and discuss how we can help you move your content over IP, on booth SU4721 at NAB 2016.